Features: V3.0+EDR Bluetooth version, available for most of devices with Bluetooth function. Elastic knitted material, warm, soft and stylish design. Protects you from cold winter and will also allow you to listen to music and talk while doing variety of other activities. Built-in microphone, available for cell phone to transmit the speaking phone to your audio devices directly, hands-free answering. Built-in Li-ion chargeable battery, charge via USB cable, long stand-by time. Headphone can be taken off so that you can wash the hat. Allows you to keep your music where it belongs – in your ears. 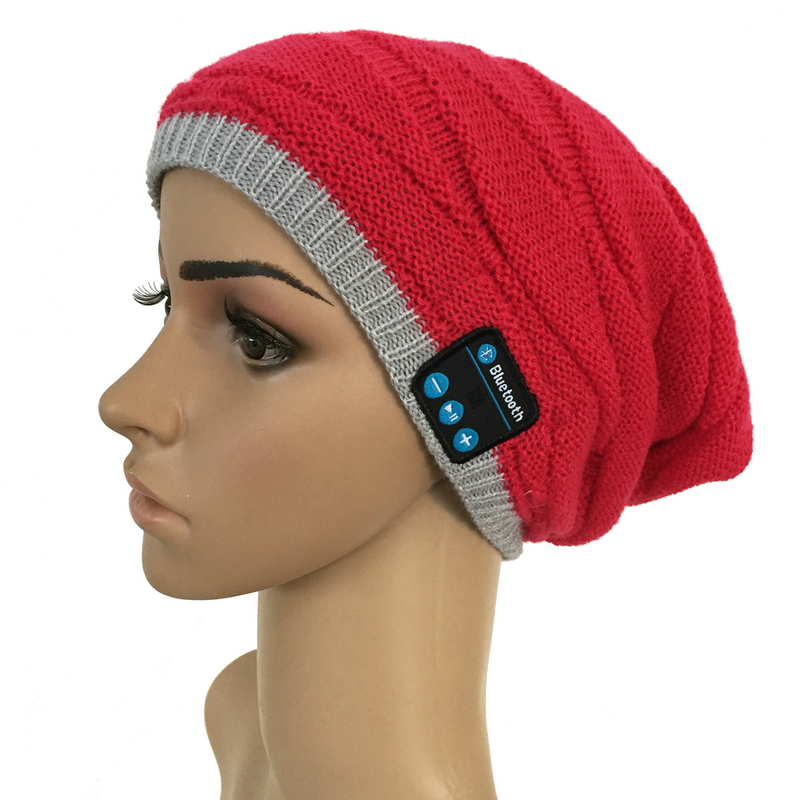 You will look great and keep warm while listening to your favorite music. Keep the sound track to your life playing all the time. Perfect for traveling, waiting for the bus, jogging in the cold or just rocking out in your bedroom. Specifications: Bluetooth version: V3.0+EDR Frequency: 2.4026GHz-2.480GHz Transmission distance: 10M / 32.80ft Transmission distance of Mic: ≤1M / 3.28ft Li-ion battery: 3.7V/200mA Charging time: 2 hours Number of charge: > 1000 times Charging voltage: DC 5V Standby time: 30 hours or so Continuous working time: about 5 hours Bluetooth name: Bluetooth Hat/Call me (you may search one of them) Color: (optional) Item weight: 120g Package size: 28 * 13 * 3.2cm (L * W * H) Package weight: 160g User tips: The music Bluetooth hat is designed to be reused and it is washable. Therefor the icon panel on the hat is not fixed to the buttons. If you the icons do not match the control buttons, please manually adjust them. The control panel is perfectly positioned if you see full indication light from the light window. Press the ON/OFF button for 2.5seconds, the device is open once “BLUE” LED slowly flash. Press 2.5 seconds again, device close. Due to different Bluetooth module, you may search one of the Bluetooth name: “Bluetooth Hat”, “Call me” on the Bluetooth device list of your smart phone, no password needed. Make sure you enable both call audio and media audio on your Bluetooth set up menu on your phone.